Several years ago when my husband and I were anticipating a milestone anniversary, we decided to celebrate and recharge in a grand way. Short on vacation time, we booked a transatlantic crossing on the legendary Queen Mary 2 (QM2), scheduled to leave Southampton, England on a Tuesday morning and return to its berth in New York City the next Monday. 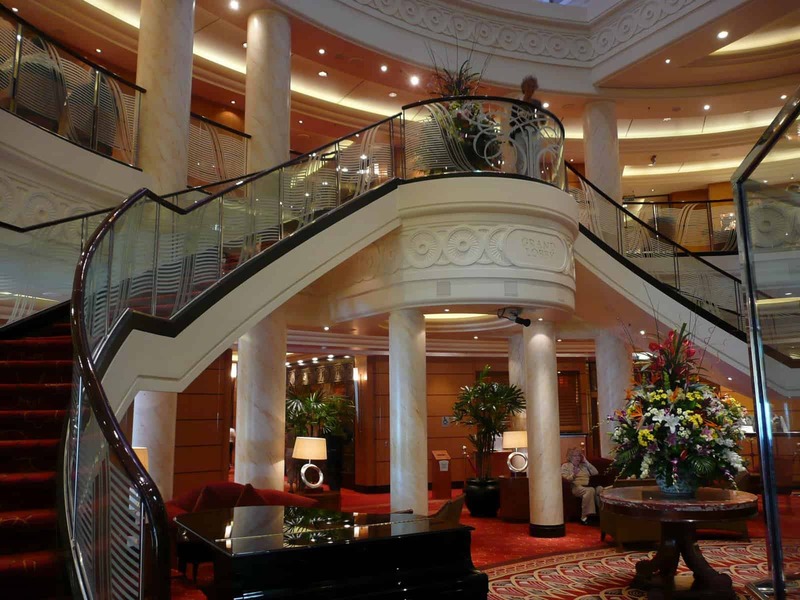 The iconic Cunard Line promised the perfect mix of elegance and tradition. We chose a “crossing” as opposed to a “cruise” because we truly wanted to slow down. Our day-to-day lives were hectic enough that we coveted time uninterrupted — time on the ship and time alone with each other. We were smitten by the beauty and allure of ocean liners we previously had seen only on posters and postcards and wanted downtime. When you first see the Queen’s 17 statuesque decks, it’s hard not to be awestruck. At a length of 1132 feet (the equivalent of five city blocks on Fifth Avenue) and a height of 237 feet (from the keel to the top of her trademark red and black funnel), the ship appears larger than life. The hull was narrower and deeper than that of a cruise ship, affording it the necessary stability and speed for the harsh North Atlantic seas. Opening the door to our Princess Grill cabin with a balcony on the tenth deck, Room 10051, we were delighted by the space and light. Blond wood cabinetry with black accents — and tasteful damask upholstery in pale beiges and greens on the king-size bed — complemented the stunning art deco paintings, sculptures and décor found elsewhere on the ship. With a walk-in closet and floor-to-ceiling wardrobes, there was adequate space to comfortably stow all our belongings. With generous helpings of champagne and caviar, the cabin soon became our cocoon. Since we were headed home from the start, we weren’t in any rush to reach our destination. We simply wanted to enjoy the trip — as did an earlier generation before ocean travel was supplanted with jets. But the activity and energy of the ship beckoned us. The daily program offered more social, recreational and educational offerings than anyone could squeeze into a day, so we had to make strategic choices. We ruled out sunbathing and outdoor swimming because the air temperature crossing the Atlantic, even in the middle of summer, can be a bit brisk unless you like to sunbathe with jackets and blankets (and some did!). We decided to stick to our plan to exercise and relax each day at the lush Canyon Ranch Spa on board and to catch up on reading as we sat beside the wide portholes on the third deck distracted by the huge waves crashing against the boat. We also took classes in digital photography, attended a lecture on how to write a book, and attended a talk on British politics. Cruise or crossing, much of your time on any ship is “consumed” with meals — and this experience was no different. We took advantage of complimentary room service most mornings, and sipped cappuccino on the balcony with no land in sight. We enjoyed elegant meals in the Todd English restaurant or the Princess Grill. Later in the evening, we tried our luck in the casino, danced at the Black and White Ball, or watched live performances in the theater. High tea was our chance to sit back and observe fellow travelers. Time was definitely on our side as we sailed through five different time zones. Each evening after the initial night of our departure, we were reminded to set back our clocks to recapture another hour of time. For those of us who dread the sound of an alarm clock, it was an unexpected pleasure to awaken each morning feeling so refreshed. All good times come to an end, but no end was more glorious than this one. Early Monday morning, as the sun was rising, we slowly pulled into New York Harbor, witnessing a spectacular view of the Statue of Liberty. It was thrilling to think about what it was like when our grandparents made the same journey without the luxury, security and modern amenities of the QM2. We arrived home by taxi in less than an hour later, without a bit of jet lag, looking forward to our next opportunity to fool Father Time.